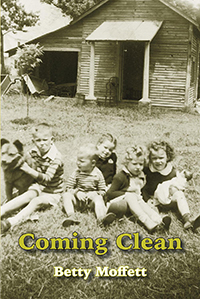 Betty Moffett’s Coming Clean (Ice Cube Press, October 2018) tells stories of her days growing up in North Carolina as well as her time spent in Grinnell. She came to Grinnell with her husband Sandy Moffett, professor emeritus of theatre, and taught for nearly 30 years in the Grinnell College Writing Lab. Then she began using the advice she offered students in her own work.